The Saskatoon Blades point streak to start 2014 came to an end on Tuesday night in Medicine Hat. The Blades got a late goal to even the score before the Tigers pulled back ahead with a Chad Butcher goal late in the third period, sealing the victory on home ice. The game started off with a great pace as there was only a pair of whistles in the first 6:34 of the game. The team’s traded chances through that opening stretch, with the shots sitting at 4-3 for Medicine Hat. 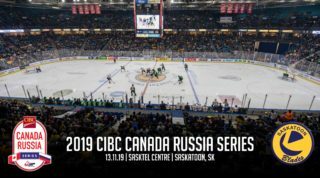 It was also a physical start to the game, with Turner Ottenbreit, Nikita Scherbak, Nick Zajac and Chase Clayton all have big hits in the early stages of the game. Troy Trombley was also tested more frequently as the period went on, including a pair of big back to back stops by the Blades goalie off a Dylan Bredo wraparound chance near the mid-point of the frame. But, after denying another pair of chances, the Tigers finally broke through for the opening goal. Logan McVeigh shot and scored from the bottom of the left circle at 11:32, netting his 7th of the season with Jake Doty and Matt Staples assisting on the play. The Blades then were forced to the penalty kill on back to back situations as both Cory Millette and Graeme Craig took penalties for awkward hits on Tigers. But, Saskatoon’s PK unit killed both penalties off and headed into the intermission trailing 1-0. Shots were 15-6 for the Tigers through 20 minutes. The middle stanza started off with some good chances for the Tigers. Just over a minute into the period they threw a pair of pucks on net from outside, with Trombley fighting through traffic to keep them out. Another great chance happened nearly 4 minutes into the frame when Curtis Valk hit Cole Sanford in front, but he lifted his wide open look over the cage. The Blades then had a pair of good chances of their own. Walking down the right wing on a 2 on 1 rush, Ryan Graham attempted to shoot, with his stick snapping in his hands. Then it was Cory Millette being stopped from in tight at the end of a PP, with Tigers goalie Daniel Wapple sliding to his left to just get his glove on the puck. After Saskatoon failed to score on a PP shortly after the first, the Tigers went back to work with more pressure. 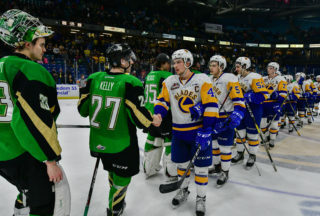 Curtis Valk had three back to back chances with 7 minutes remaining in the period, with Trombley standing tall with his 6’6 frame, stopping them all. The period then came to an end with Medicine Hat outshooting the Blades 10-4 in the frame for a two period total of 25-10. The Blades came out with a good chance in the first two minutes of the frame as Ryan Graham used speed down the left wing and unleashed a hard shot on Wapple. But, the puck just deflected off the Tigers goaltender’s shoulder and over the net. Then on the PP, the Blades came close to tying it as Scherbak used speed off the rush and also got a great hard shot away. This attempt went off Wapple’s other shoulder and just stayed out. Then the Blades hard work paid off. With 9:00 to play in the frame, Cory Millette threw the puck on net from behind the goal line, with the disc hitting a defender and bounding behind Wapple to tie the game up. 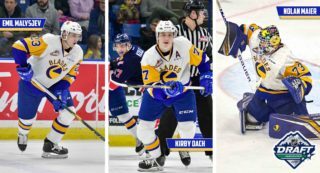 Cameron Hebig picked up the loan assist in his return to the Blades lineup after coming home from the World Under-17 Hockey Challenge in Nova Scotia. But the Tigers didn’t sit back, they almost made it a 2-1 only seconds after the tying goal when Miles Koules was able to walk across the top of the crease and nearly slide one past Trombley, who did keep the puck out. That pressure eventually paid off for the Tigers, too. After a great point blank save by Trombley on Steven Owre, Penner fed the puck to Chad Butcher who beat the Blades goalie from in tight to make it 2-1 at 15:33 of the third. The Blades didn’t let the goal get them down as Zajac, Graham and Ayrton Nikkel all had attempts late but Wapple and the Tigers held on for the 2-1 win. 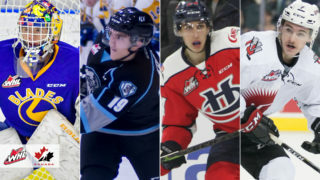 You can find the WHL’s official game summary page here. 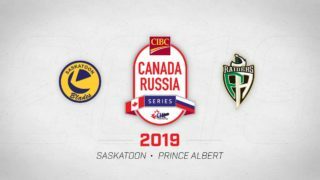 Saskatoon’s next game goes on Wednesday night as they play host to the Calgary Hitmen. You can find your tickets for that game by clicking here.